Pancakes made out of just Bananas and Eggs, oooh-wwweee! Add cinnamon, and paprika just for kicks and toppings of your choice. One morning last week, I was looking for a nice recipe to make a killer breakfast using items that I already had in the kitchen. I came across this great recipe from seriouseats.com and adapted it to fit my fridge and pantry. This delightful breakfast has all of the glory of a gooey egg with way less of the frying. 1. Preheat oven to 400 F. Chop the potato into cubes, throw them in a medium saucepan, cover with water and enough salt to make it taste like the ocean. Bring to a boil and let simmer until potatoes are just firm. about 5 minutes. 2. While potatoes are simmering, dice your onion and mince your garlic. Small to medium, depending on your preference, set aside. 3. Remove potatoes from heat and drain in colander. Let cool for a few moments. 4. While potatoes are cooling, get at your kale. Remove stems and coarsely chop leaves. You are looking for about 2 cups tightly packed. 5. Choose a skillet with all oven proof components and set it on the stove. Heat 1 -2 tablespoons canola oil (or other high heat variety) and add potatoes, season with salt and pepper. You want the potatoes to brown nicely on all sides, so let them sit in the pan, feel free to move around, but do not stir too much. After about 4 minutes, check for golden brownness and flip when ready! 6. Once potatoes are evenly browned add minced garlic and chopped onions to the pan. Stir around and let them cook for about 2 minutes. 7. When the room is smelling decadent with onions and garlic, add chopped kale. 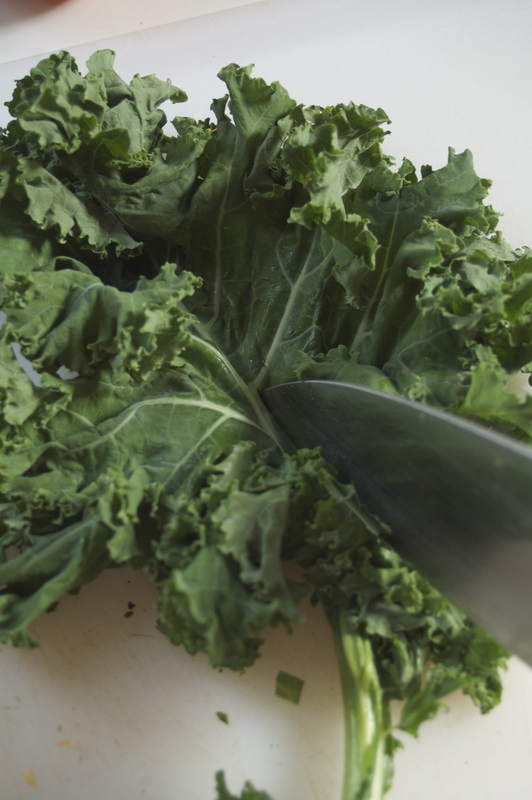 Let the kale steam and cook, stirring lightly to make sure all leaves get some oil on them, until the leaves are wilted. 8. Add about 1-2 tbsp BBQ sauce and mix evenly throughout the potato, onion and kale mixture. If you do not have a delightful jar of BBQ sauce lying around, hot sauce will do too! 9. Now the fun part, using the back of a wooden spoon make 4 little wells in the hash, and drop around a teaspoon of olive oil in each. Next, crack an egg into each of the wells and season with salt and pepper. 11. Use these 10 minutes to gather some garnishes for your delightful egg bake hash. Any fresh herbs will do nicely, as well as an avocado if you've got it! I like to complete each breakfast with a few slices of fruit to start off the day right. 12. Check on the eggs and when they are white and set, pull from the oven, garnish, and serve immediately! Using a wooden spoon or silicon spatula, loosen up each portion and then lift pan over desired plate, tilt and scoot your meal right on there! 13. Voila! Potato Kale Breakfast Hash. I added some chopped cheddar cheese as well. Adjust salt and pepper as needed.